CHICAGO–One team moved slowly and the other one moved quickly, but they each scored touchdowns and the Packers and Bears were tied, 7-7, following one quarter of play at Soldier Field on Sunday, but the Bears were on the Packers 1-yard line as time expired. The Bears were the first to take possession and quickly moved across midfield. From the Packers 37, Matt Forte gained 4 yards. A short completion from Jay Cutler to Forte left the Bears with third-and-4. Cutler scrambled for a first down and an illegal-hands-to-the-face penalty against Julius Peppers put the ball on the 14. A Cutler-to-Forte gave the Bears a first down at the 3. On third-and-goal from the 6, Cutler threw to Brandon Marshall for a touchdown. Davon House fell as Cutler was throwing the ball. The drive was 80 yards in 15 plays, 8:30 in time of possession. The Packers took possession at their 19-yard line and after a short completion to tight end Richard Rodgers, Aaron Rodgers hit his namesake for 43 yards. An up-tempo, no-huddle 17-yard completion to Jordy Nelson put the ball at the Bears 12. Another pass to Nelson moved the ball to the 2, from where Eddie Lacy scored on the only run of the drive. With 4:08 to play, the game was tied, 7-7, and the no-huddle was no problem. Forte immediately kick-started the Bears’ next drive with a 17-yard run. The Bears were gashing the Packers with the run and had a first down at the Packers 44. On fourth-and-1 from the Packers 35, Cutler fumbled the exchange, picked the ball up and ran for a first down. A personal foul on Sam Shields moved the ball to the 10. A Cutler completion to the 1 followed, and that’s where the first quarter ended. The following players have been declared as inactive for Sunday afternoon’s game between the Green Bay Packers and the Chicago Bears at Soldier Field. The Packers have just six inactive players because the current roster is at 52 players. CHICAGO–Aaron Rodgers completed a 48-yard touchdown pass to Randall Cobb with 38 seconds to play, and the Packers claimed their third consecutive NFC North title with a 33-28 win over the Bears at Soldier Field on Sunday. Trailing 28-20, the Packers were in hurry-up mode when Aaron Rodgers became the Rodgers of old. He moved the Packers quickly into scoring territory with throws to Jordy Nelson and James Jones for a combined 46 yards. A pass to Andrew Quarless gained 22 yards to the Bears 6-yard line, from where Eddie Lacy ran the ball into the end zone to cut the Bears’ lead to 28-27 with 11:38 to play in regulation. The Bears took possession at their 26. Two runs by Matt Forte left third-and-two. Forte gained 10 yards to the Bears 45. Jay Cutler pitched consecutive completions and the Bears had a first down at the Packers 38. On second-and-12, the Packers dropped Forte for a loss of five yards, bringing up a third-and-17 that would be the play of the game for the Packers defense with 6:38 to play; the game was on the line. Cutler’s bomb for Alshon Jeffery was knocked away by Sam Shields, forcing a punt that would be fair-caught at the Packers 12. Dramatically, the game was in the hands of the man who was in his comeback from a broken collarbone. Aaron Rodgers and the Packers needed a field goal to win. Lacy gained a couple, as the clock ticked under six minutes. The Packers would face third-and-2 and Lacy came up inches short on what was a controversial spot by Referee Clete Blakeman’s crew. The Packers would go for it on fourth down and John Kuhn got the first down. A wide receiver screen pass to James Jones gained 6. An incompletion, however, left third-and-6. Rodgers scrambled for a first down. A pass to Nelson gained 7. Lacy gained 2; third-and-1, again. Lacy was stuffed for no gain and the Packers’ season was on the line at the 2-minute warning. Rodgers threw to Nelson; first down at the 50-yard line. Time was now an issue, as the Packers were down to one timeout remaining. On third-and-8, Nelson dropped a pass that would’ve gained a first down and have put Mason Crosby in field goal range. It would be fourth-and-8. Rodgers found a wide-open Randall Cobb for 48 yards and a touchdown, and the Packers had the lead, 33-28, with 38 seconds to play in regulation. The two-point try failed and the game was now in the hands of the Packers kickoff team and the defense. Devin Hester’s return gave the Bears the ball at their 40. Cutler completed a pass to the Packers 45; :24 was left on the clock. A deep ball was incomplete in the end zone; :16 remained. Cutler threw errantly over the middle; :10 remained to be played. Shields intercepted Cutler’s next pass. The Packers were champs, again. CHICAGO–The Bears were on the Packers 5-yard line and held a 21-20 lead when the third quarter ended at Soldier Field on Sunday. Following a three-and-out to start the second half, the Packers allowed a 49-yard punt return by Devin Hester and the Bears began at the Packers 30-yard line. Matt Forte found 15 yards up the middle. Forte converted third down with a 3-yard run to the 5. One play later, Forte cut back to his left and strolled into the end zone untouched. The Bears led, 14-13, with 10:46 to play in the third quarter. The drive was 30 yards in five plays. Eddie Lacy broke loose on a 17-yard run that nearly went the distance. On third-and-1 from the Packers 46, James Starks tore through a huge in the middle of the Bears defense for 41 yards and a first down at the Bears 13. On third-and-four, Aaron Rodgers threw to Randall Cobb for a 7-yard touchdown that put the Packers back into the lead, 20-14, with 7:27 to play in the third quarter. The Packers’ next kickoff was of the pooch, anti-Hester variety and left the Bears to begin at their 26-yard line. Three plays later, however, Sam Shields was burned by Alson Jeffery for a 67-yard bomb from Jay Cutler. Forte scored from a yard out with 5:04 to play in the third quarter and the Bears were back in the lead, 21-20. Rodgers rallied back with an 18-yard pass to Jordy Nelson. The Packers were now in their no-huddle offense. An incompletion was challenged by Mike McCarthy, who lost the challenge. That left third-and-10 from the Packers 38. Rodgers threw incomplete and the Packers were forced to punt. Forte ran for a couple of first downs and across midfield. Then Cutler dumped a pass into the left flat to a wide-0pen Forte, who gained 33 yards to the 8-yard line. CHICAGO — With the help of a wacky play, the Packers scored 13 unanswered points in the second quarter to take a 13-7 lead into halftime at Soldier Field on Sunday. Down 7-0 at the start of the quarter, the Packers had a scoring opportunity thwarted by another interception. One play after a 32-yard pass to Nelson put the Packers on the Chicago 26-yard line, a quick slant to Nelson bounced off his hands and was picked off by Bears CB Tim Jennings. That was QB Aaron Rodgers’ second INT of the half. The Packers defense responded with a three-and-out, though, and the offense went back on the attack. A 26-yard pass to Nelson converted a third down and got the ball across midfield, and then a personal foul on Bears DE Shea McClellin following a Lance Briggs third-down sack gave the Packers a first down in the red zone. But the drive stalled there, as Rodgers’ third-down pass for Nelson in the end zone was too high, and the Packers settled for a 33-yard Mason Crosby field goal to make it 7-3 with 7:59 left in the half. After Bears returner Devin Hester recovered his own fumble on the kickoff return, the Packers defense got a second straight three-and-out, with the help of a first-down sack by LB Andy Mulumba, and the offense took over in good field position, at the Chicago 41. That drive ended in one of the stranger touchdowns. 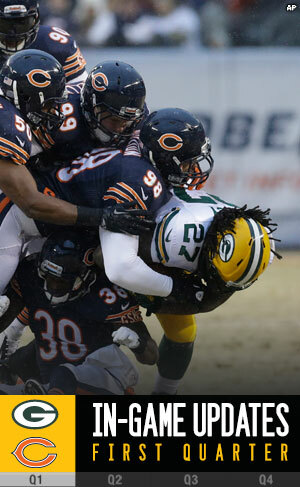 With first down on the Chicago 17, Rodgers was sacked by Bears DE Julius Peppers, who knocked the ball loose. With most players on the field assuming it was an incomplete pass, Packers WR Jarrett Boykin — at the urging of Rodgers — picked up the ball and ran 15 yards into the end zone for the score. The play was reviewed, as all scoring plays are, and it was determined the ball came out of Rodgers’ throwing hand before his arm started going forward to throw. It was a fumble, and the touchdown stood, giving the Packers a 10-7 lead with 3:28 left in the half. The Packers got the ball right back, as Bears WR Alshon Jeffery fumbled after a reception following a hit by LB A.J. Hawk. Packers S Morgan Burnett recovered, lateraled to CB Sam Shields, and the Packers took over on the Bears’ 28-yard line. A 16-yard pass to Nelson converted third down and made it first-and-goal on the 9, but the Packers couldn’t punch it in and had to settle for a 27-yard FG by Crosby with 2 seconds left in the half. CHICAGO–Matt Forte scored on a 4-yard touchdown pass from Jay Cutler, and the Bears held a 7-0 lead over the Packers after one quarter of play at Soldier Field on Sunday. The Packers defense pitched an impressive three-and-out after the Bears began the opening series of the game at the Packers 42-yard line following a long kickoff return by Devin Hester and a personal foul penalty on Victor Alyewa. 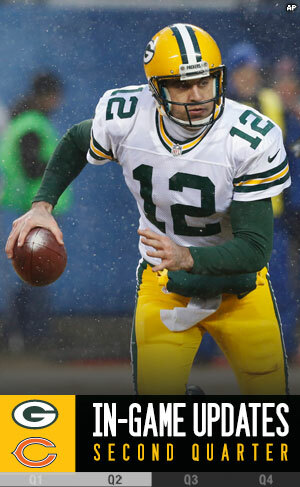 Aaron Rodgers made his return to action with a possession that began at the Packers 20-yard line. Right away, Eddie Lacy went to work with a 14-yard run around left end. Rodgers completed his first pass to Jarrett Boykin for 5 yards. His next toss was to Andrew Quarless for 9 yards to near midfield. The Packers faced a third-and-3 at the Bears 45. Rodgers hit Jordy Nelson on a slant for 14 yards and a first down at the Chicago 31. Lacy gained 6 yards on a cutback run to the left side. 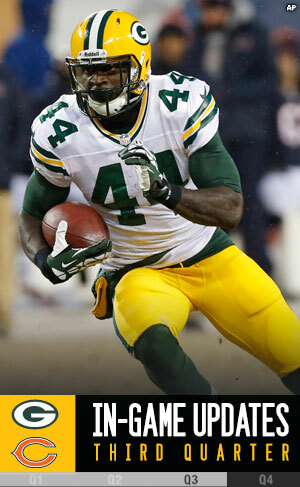 Following a drop by James Starks, Rodgers faced third-and-4. Rodgers’ pass over the middle for Nelson resulted in a holding penalty against Bears defensive back Isaiah Frey and a first down for the Packers at the Bears 20. Following two short completions, the Packers faced third-and-5. Rodgers pitched a 6-yard completion to Nelson. 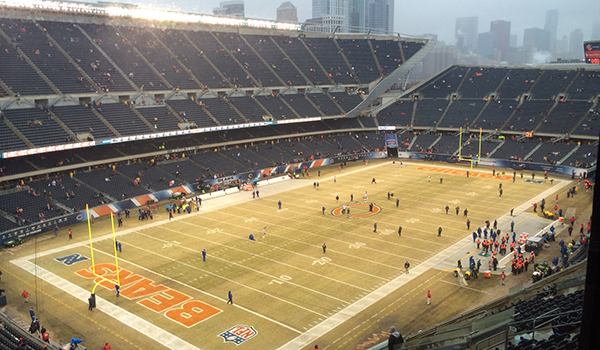 As snow began to fall, Lacy gained 4 to the 5-yard line. A sack for no yards lost forced third-and-goal from the Bears 5. Rodgers was then intercepted in the end zone by Chris Conte. A Jay Cutler completion and a 20-yard run by Matt Forte put the ball quickly at the Green Bay 47-yard line. Cutler then hit Brandon Marshall down the left sideline, over Sam Shields, for 37 yards to the Packers 8-yard line. The Bears faced third-and-goal from the 4-yard line. Cutler threw to Forte for a touchdown that gave the Bears a 7-0 lead with 2:07 to play in the first quarter.